Skills for Handling Your Reactive or Hyperactive Dog – Part 2, the next steps for a pleasant walk. The length of time it takes – whether 10 minutes, 10 days, or 10 months – to see a noticeable improvement in your dog depends largely upon your ability to direct and guide your dog. 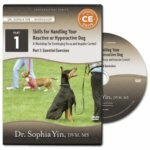 Now you can learn the skills to address your dog’s reactivity from the comfort of your own home with this engaging video of one of Dr. Sophia Yin’s most popular hands-on workshops. In a series of fun and practical exercises for both humans and dogs, Dr. Yin teaches you exactly how to move quickly and clearly enough to keep your dog interested and focused on your training. Step-by-step exercises are demonstrated, such as flash-lure drills, speed, posture, and movement drills, and situational reaction drills, first with humans only and then with handlers working with their reactive dogs. Find out how to provide leadership through skill rather than force. Transform your relationship with your reactive dog, as he happily learns impulse control and to look to you for guidance and direction.